Hi, everyone! 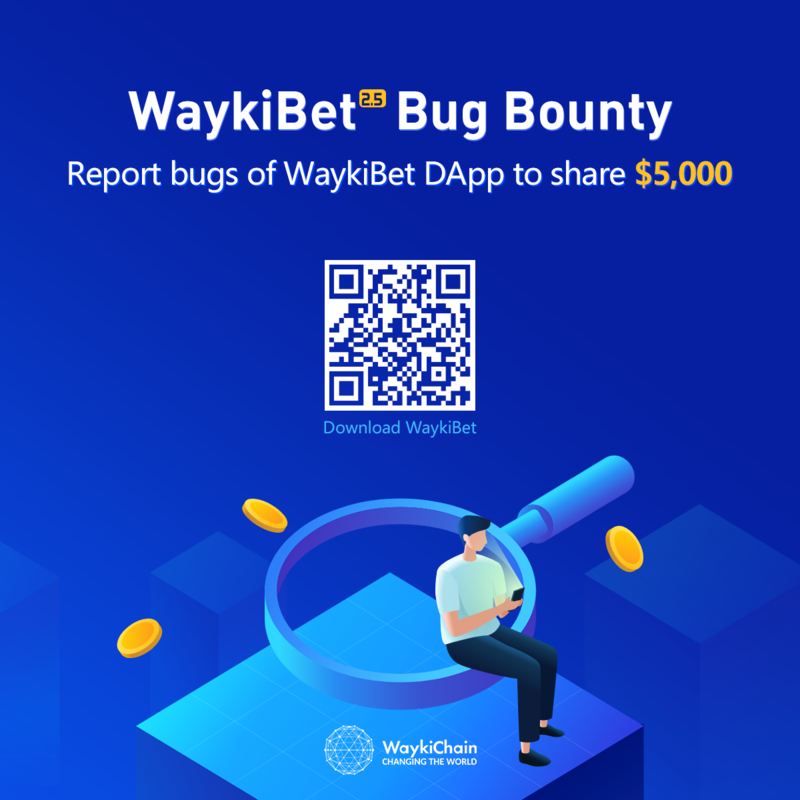 Come to join in WaykiBet 2.5 Bug Bounty to share 5,000 USD reward! WaykiBet DApp V2.5 has officially launched! WaykiBet is a decentralized betting platform that runs on WaykiChain public chain. Compared to other betting products, users can build a bet with one-click in WaykiBet, with high return rate and more convenient user experience. WaykiChain is now holding a bug bounty in community. Users can report bugs or optimizing suggestions of WaykiBet 2.5. If the bugs or suggestions are adopted, users can share total 5,000 USD bounty. Ordinary optimizing suggestions share 30% of the bounty. Important optimizing suggestions share 70% of the bounty. Besides, we will randomly choose 10 comments to each send 66 free WICC (worth $15). 1.Please directly report the bugs or suggestion in comment and describe in detail as much as possible. 2.If there are comments reporting the same bug, only the first comment will be chosen. 3.This bounty activity ends at Nov. 18. 4.WaykiChain owns the final interpretation of this activity. By accessing game data from authoritative third-party, WaykiBet ensures the timeliness and accuracy of the game results. Users can build fixed-odds bets after referring authoritative data at any time. After the game is over, the smart contract will automatically calculate the results and deliver the payout, without manual participation in the whole process. WaykiBet uses odds ranking, which will show the highest odds option of one same game at the top. With odds ranking, users can choose odds and corresponding betting amount to get highest return. WaykiBet uses fixed odds, users can check their estimated return before placing the bet. Based on blockchain's openness and irreversibility, all operation records in WaykiBet will be recorded on WaykiChain public chain, and can be checked at any time. Besides, through hybrid architecture, WaykiBet has solved the problems of current blockchain transaction: long confirming time, low efficiency and handling fee, etc. 1.WaykiBet is available for registering in the following countries and regions: China, USA, Japan, India, Vietnam, South Korea, UK, Netherlands, Nigeria, Hong Kong, Macau, Taiwan. 2.WTEST used in WaykiBet is test coin. WaykiChain does not provide any two-way exchange channel for WTEST. 3.From Nov. 2 to Nov. 15, every registered user will get 100 airdropping WTEST at 11am (UTC+8) everyday.